Well its been a little while since I’ve done a film review, but I felt motivated enough to do this one. Telling the story of how the Rebel Alliance got the Death Star plans this is a stand alone film set in the Star wars universe. I wondered if it’d stand up to the behemoths of the ongoing story (the original trilogy and the start of the new one). It does so very well. The style, aesthetics and props all tie (!) in with the main films seamlessly. 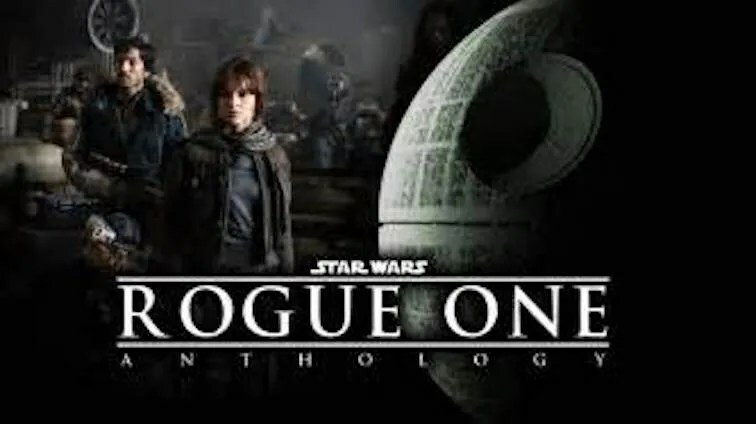 The plot is a good one and as others have mentioned is more of a war film than a space opera. I’ve watched it a couple of times now and really enjoy it, in fact its main drawback is that all the main characters die – I’d have loved to see more of them ! Even the supporting characters could have had a longer life IMHO. Minor quibbles – the opening ten minutes or so has a few too many new locations and jumps around a lot so repeat viewing is a bonus. There’s a lot of new Imperial Stormtrooper types that aren’t seen in the original trilogy (maybe in the next trilogy ?) so a bit of a discontinuity error. That and the whole “Bothan spies” comment in SW:ANH. 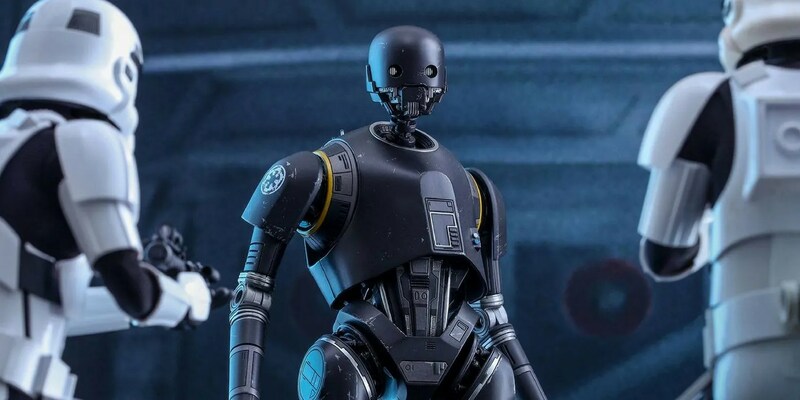 Stand out supporting character was the droid, K-2SO. At first you think he is just a pale imitation of C3PO, but it soon becomes apparent that while he is a pedant, he is also much more cynical and perfectly capable lof a bit of direct violence. Criticism has been levelled at the CGI of Grand Moff Tarkin (Peter Cushing) and Princes Leia (Carrie Fisher). Whilst I have not watched in HD, the former is easily part of the scenes and does not jar. The later is slightly more “plastic” but as it is towards the end and very limited not a major problem for this film. Go get it, and watch it a couple of times, its a keeper. Yet another great actor dies – Peter Vaughan. Whilst best known as Harry “Genial” Grouty in Porridge, he also appeared in a number of great films including Brazil, and The Time Bandits. 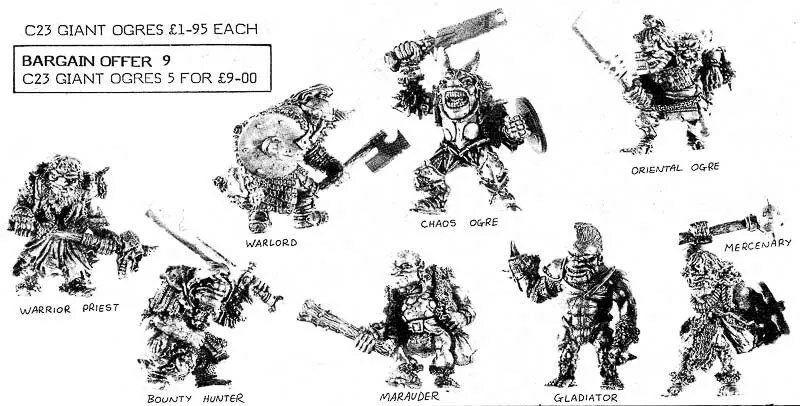 Winston the Ogre: There used to be a time when you could be sure of catching old boots, cans, hat racks, boxes. Now it’s prawns all the bloody time. I feel that I must name my next Ogre character/hired hand after him. Mrs. Ogre: Aren’t they lovely? We can have them for breakfast. Winston the Ogre: You mean eat their boots? Andrew sachs, actor who played Manuel in Farty Towels passed away a couple of weeks ago. I know what I’ll be watching tonight. Apparently, Andrew Sachs did actually get burnt filming this. So as promised a review of the latest season that came out on DVD in the UK a couple of weeks ago. Funnily enough, I had a conversation with my dentist of 29 years who regards my mouth as boring (full head of teeth, no caps, crowns or fillings, nothing for him to do) about this and we both agreed we were geeks who like it. I joked given my full head of teeth, come the zombie apocalypse, people will either have to protect me, or avoid me as if I got turned into a zombie my bite would be ferocious. 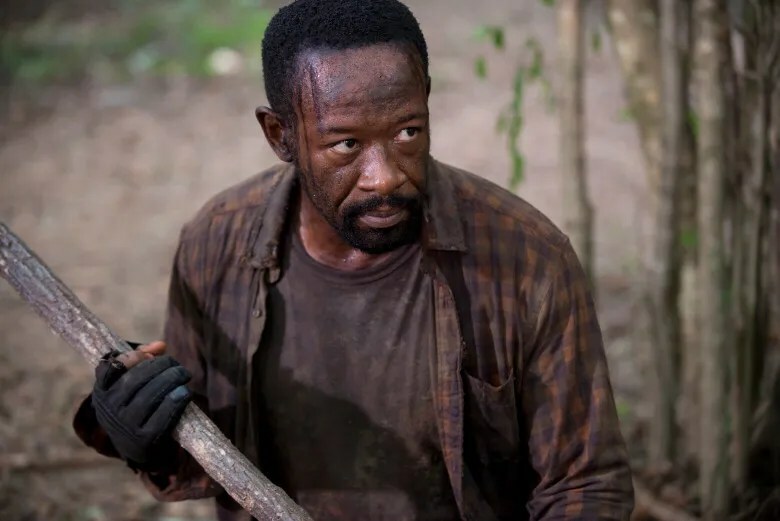 Morgan is now back as a regular cast member, Lenny James is a great actor, and I liked his work in Jericho. Morgan has gone all Kendo Master on us, and wields an awesome stick to kill zombies efficiently and quietly. Other characters get their back stories filled in, even annoying kids. A couple of new Alexandrian characters turn up and are even useful. However, the settlement is threatened when they find a nearby quarry fun of walkers who are slowly breaking out, and this is a massive herd. So via a series of flashbacks, the story is told of how most of the herd are taken off course. 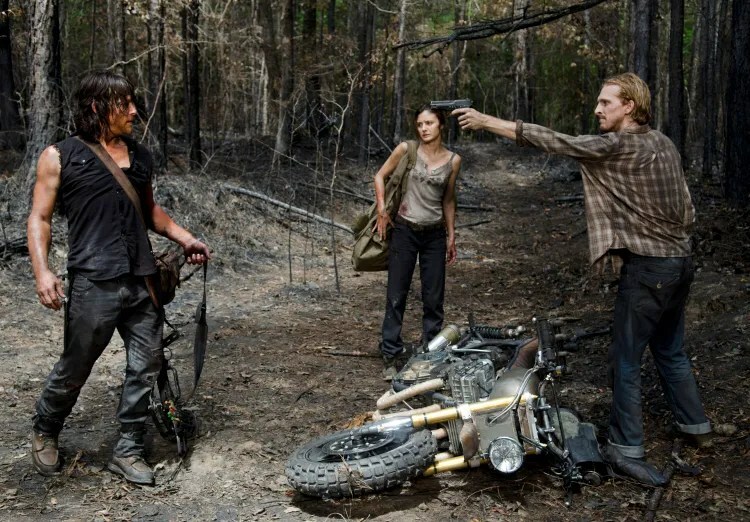 In the process, Daryl, Abraham and Sasha have a side adventure, involving RPGs and meet up with members of the Saviours group with varying success. Yup, Daryl after trying out the 3 questions on some escapees he encounters is double crossed after walking ahead of them (bad move). This however sets up an interesting arc that leads to the man he tries to help hunting for him. Now aside from recapping all the plots, which are done elsewhere, the key theme of this series if the link to Hilltop, a seeimingly civilised nearby settlement that has problem with the aforementioned Saviours. Rick and co wade in to the conflict between these groups in order to prop up Alexandria which is running low of food and brains it seems. Alexandria is falling apart, literally as the zombie herd that broke off and besieges the settlement pushes over the church tower that everyone neglected to remove from high next to the walls, and in the ensuing mayhem, many of the Alexandrians get munched including Deanna and Rick’s putative love interest Jessie, whose son then goes on to shoot Carl in the eye. Despite all these problems at home, Rick and co variously hare off to take on the Saviours, all without understanding the true scale of the Saviours’ greater numbers and logistics. 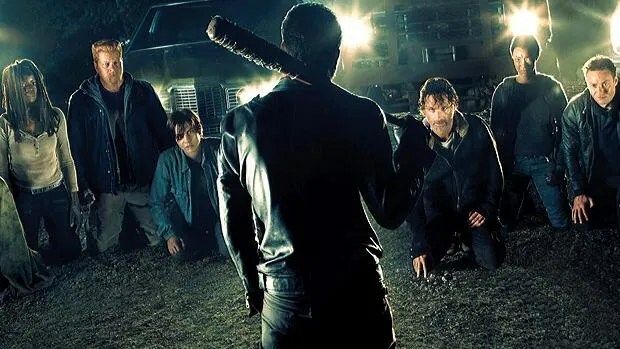 As a result, they are caught out time and time again and end up on their knees in front of the Savious’ leader, Negan. And we all know how that scene ends – the big cliffhanger as to who gets splatted. …Carol in a new relationship can’t cope with everything working out and goes AWOL, on her own, underarmed. DOH ! 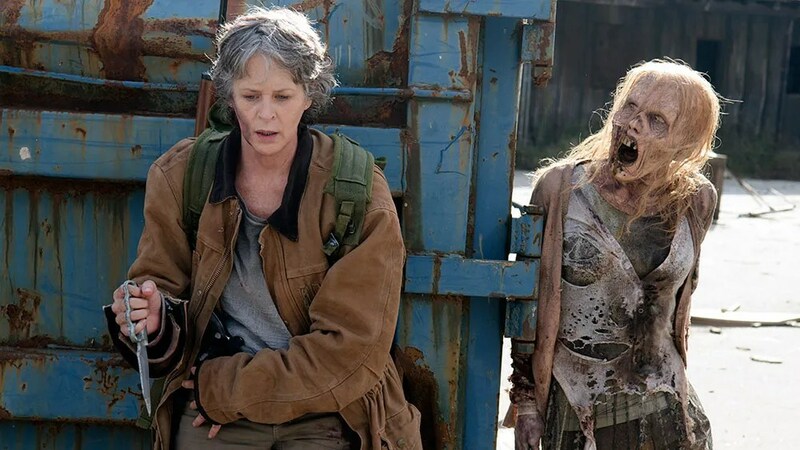 And we all know what happens in the post apocalypse zombie world, she gets into trouble both with walkers, and one of the Saviours. Luckily Morgan has been tracking her and saves her in the nick of time, when some more strangers turn up and may turn out to be allies. Well that’s a very potted over view. Key question : Did I enjoy the series ? I watched it the first time round, and found the starting few episodes somewhat patchy and difficult to follow. 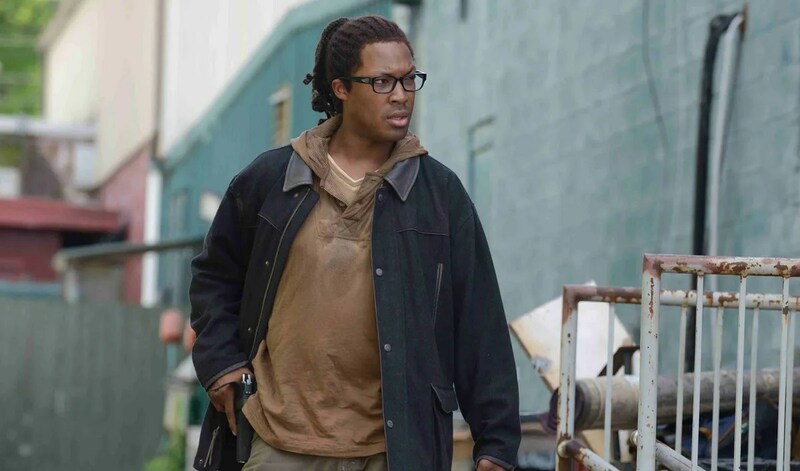 The total failure of the Alexandria group to clear the area around their walls was another clear failure (I talked about this on Season 2), allowing people to creep up and infiltrate, break down the walls and so on. The group entering in to a deal, when clearly unaware of the strength of their enemies. Various characters haring off on their own vendettas and all distracting others to save them from the inevitable and predictable problems. That said, on watching the entire season a second time, there is a lot more nuance and background material that can be easily missed on the first viewing and that makes this season a bit of a slow burner that will reward over repeated watches. I’m looking forward to Season 7. PS: Carl needs a haircut, badly ! As well as renovating ruins, I’ve being busy with other media, including Jurassic World. Now, I’d liked the first couple of films in this franchise, so waited for the DVD to be cheap before buying just in case it was on its last legs. Quite simply this is film making by numbers, suitable for writers, directors and producers age 8-12. It takes the plot elements of the previous films and mashes them up in the hope that the same stuff will work again. Sorry, NO. Films don’t work like that. Films require originality. The closest this film gets to originality is to the idea that the public is jaded by the ordinary dinosaurs and need ever greater thrills. 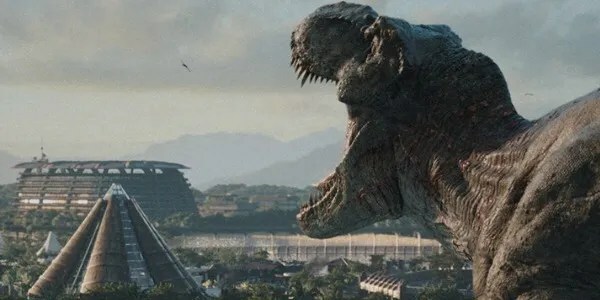 Which is ironic, because audiences probably are jaded by ever extravagant CGI effects, but the hybrid dinosaur is simply rubbish. After claiming it had been bred, and nurtured in isolation, we are expected all of a sudden it can communicate and socialise with its genetic forebears (the velicoraptors). Duh ? Well if the dinosaurs were souless CGI creations, the human actors are souless ciphers. The two brats, sorry kids, that attempt to mirror the first films endearing points fail utterly. 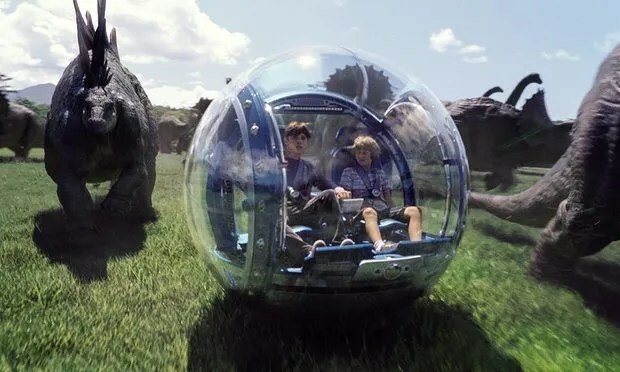 Spoilt, self centred and utterly irrelevant they go off on a wholly unnecessary gyro ball ride that is simply an excuse for more boring CGI. Their Aunt, and hapless sidekick are also caricatures, and the supposed slow burn romance between said Aunt and dinosaur whisperer whose name went in one ear and out the other, is as predictable as unlikely as could be expected. But lets tick all those plot points for some Hollywood executives. Basically, this film is like a buzzword bingo game played using a film company’s corporate mission statement. 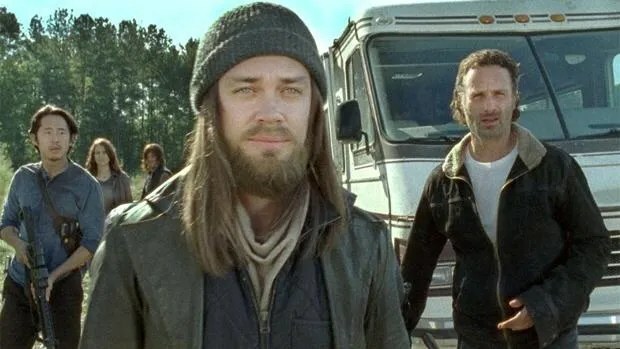 Next up, The Walking Dead Season 6, which will be a bit more interesting review…. Having been to see Star Wars (later A New Hope) as a 7 year old, I was disappointed by the prequels, so was very tentative about the new sequels. I was both pleased and disappointed when I got the DVD of The Force Awakens. So, a new desert planet (hmm where have we seen that ? 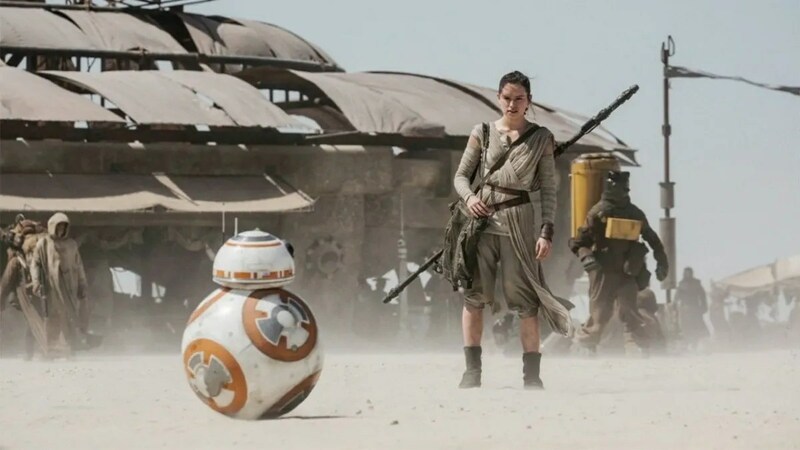 ), and a new cute droid BB8. On the upside, the main character is a woman so we move into the twentieth century at least. Again on the upside, we have a black actor as a main character. Finn is introduced well and provides some interesting ideas about why Stormtroopers always have their helmets on. So we have The First Order (son of The Empire), which is only sketchily described which may be partly for dramatic tension, but annoying for those who don’t go looking online as to what is going on. 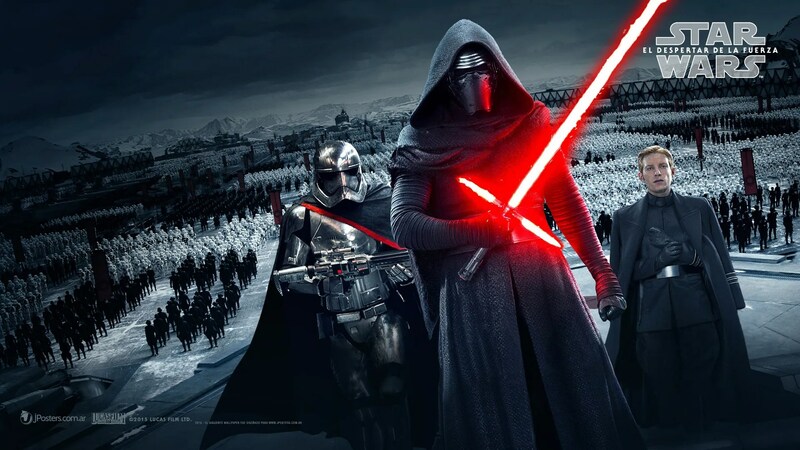 Three main protagonists are introduced – Snoke; Ren; and Hux. They’re fairly well fleshed out for what little time they have. 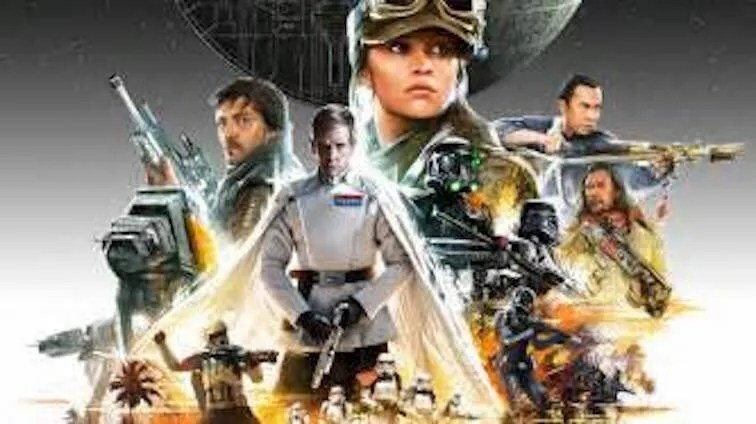 Their screen time is fairly short as with any new film setting up a franchise deliberately, a new swathe of characters have to get screen time to set up the framework the rest of the sequels will populate and develop. So as part of a franchise series no problem – annoying as a stand alone movie and therefore it compares badly to SW ANH when compared one to one. But given SW ANH was pretty much a shot in the dark and didn’t assume a trilogy was a given, its not a fair comparison. So, characterisation so far not bad, not astounding. Leia and Solo then turn up to support Rey and Finn all of which mesh well together, along with the return of C3PO and eventually R2D2. Solo’s killing was really good, very unexpected to kill of such a popular character at such short notice in the first of the sequels. 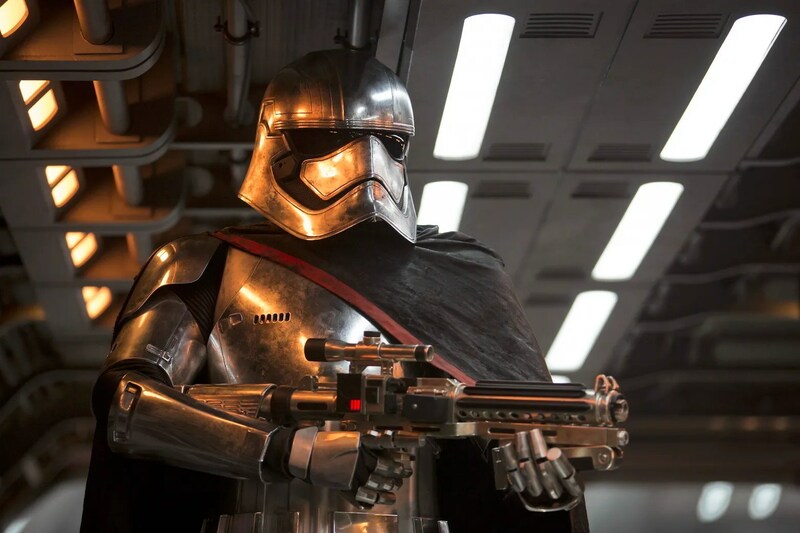 The First order’s “Star Destroyer Base” is fairly lame and results in the overall plot of the film feeling like a re-tread of ANH, which detracts from the many upsides of the film. So overall I think this is a good romp, much superior to the prequels and approaching the original series in enjoyability, and hopefully setting things up for the XII and XIII episodes. Yes, the gag with Solo allegedly dumping her into a garbage chute was a nice one, but really, she needed much more screen time to establish her character. Looks like she will return, and I hope she gets a better amount of screen time//characterisation in the following sequels. Overall, a good start to a new series of sequels, as a stand alone film so so.